The site of where the Three Gorges dam will be built on the Yangtze river is shown Sunday night, Nov. 2, 1997. The Yangtze River, the world's third longest, will be diverted Nov. 8th to allow construction of the controversial Three Gorges dam. When completed, scheduled for 2009, the Three Gorges dam will hold back a reservoir 370 miles long generating 84.7 billion kilowatts of electricity annually. More than 1.3 million people will have to be resettled to make way for thedam and the reservoir. 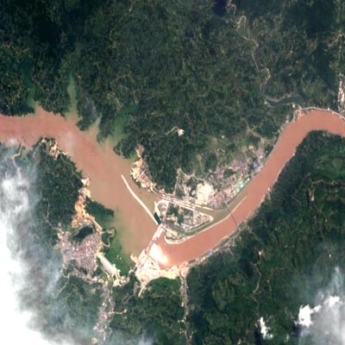 Water churns through diversion holes in the world's largest dam – China's Three Gorges project on the Yangtze River, imaged here by ESA's Proba satellite this week. Seen to the left, the waters behind the dam have risen to a level of 135 metres since the sluice gates were first closed in early June, and in August Three Gorges is due to generate its first commercial hydroelectricity. The Three Gorges project is set to create a new 600-km-long body of water on the face of the 21st century Earth: the thick concrete dam walls stand 190 metres tall and already they hold back an estimated 10 billion cubic metres of water. More than 600,000 people have had to abandon their homes to the rising reservoir, and as many again will have to relocate before the waters reach their final planned level of 175 metres. It can be clearly seen in the image how the river has burst its banks and is inundating the land upriver of the dam. The waters of the world's third-longest river appear brown in colour because they are heavy with sediment. Many environmentalists have campaigned against the €20 billion-plus Three Gorges project due to the drowning of multiple cultural heritage sites, the fear that reservoir will collect industrial pollution and sewage that cannot now be washed to the sea, and the risk posed to downstream populations if the dam should ever break. But the Chinese government says the project will tame the flood-prone Yangtze River and generate much-needed electricity for economic development. This 18-metre resolution image was acquired by the CHRIS sensor onboard Proba on 30 July 2003.